My love of Ossobuco Milanese started over a decade ago, it was at the dinner I had with my family after graduating high school. Everything we had that night was exceptional but those braised veal shanks really blew me away. There were so few ingredients and it was still just exploding with flavor, the savory sauce infused into the tender shank meat and fresh flavor of the gremolata really showed me less is moreOver the years I have taken my own spin on it, many recipes call for white wine but I prefer the deeper flavor of red wine. Also I like using fresh sage in both the sauce and gremolata. 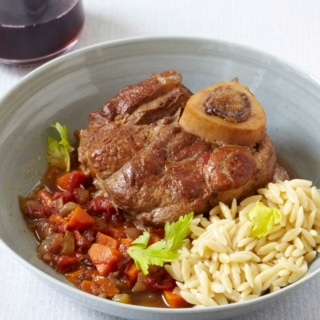 So below for you to enjoy is a simple way to prepare Ossobuco Milanese at home, I’d suggest serving this with roasted potatoes or a simple risotto. 1) Dry off the veal shanks with paper towels and use the butcher twine to tie around the veal shanks so they don’t fall apart during cooking. You will remove this after cooking is completed. Pre heat the oven to 350oF. 2) Get a pan on medium heat, add oil. Once it is hot add the veal shanks to the pan and brown the shanks. Once both sides are browned and fat has rendered in the pan, remove them and put aside in to the cake pan and keep the pan with the fat. 3) Add the onion, celery, carrot, ¾ of the garlic, ¾ of the sage and some salt and pepper. Then sauté the vegetables until the onion are starting to become tender then add the tomatoes. Once it all comes back up to a hard simmer add the wine and water and let it come back to a simmer and let it cook for 5-10 minutes. 4) While the sauce is still hot pour it over the veal shanks in the pan and cover with foil, then put it in the oven for 45 minutes. During this time you will prepare the Gremolata. 5) Get a small bowl and add the chopped parsley, lemon zest, and remainders of the sage and garlic from earlier. Mix thoroughly it should have a lemony kick if it doesn’t add small amounts of lemon juice until desired level of tartness. 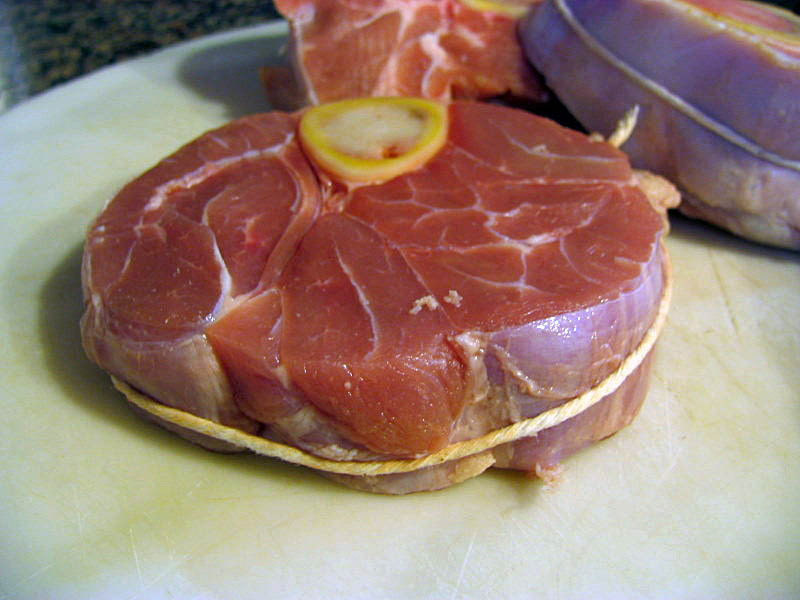 6) After 45 minutes the veal should be done, let it rest for 3-5 minutes uncovered. Cut the twine around the shanks and pour the sauce from the pan on top of the shanks. Top with 1 tsp of Gremolata and serve with your side of choice.